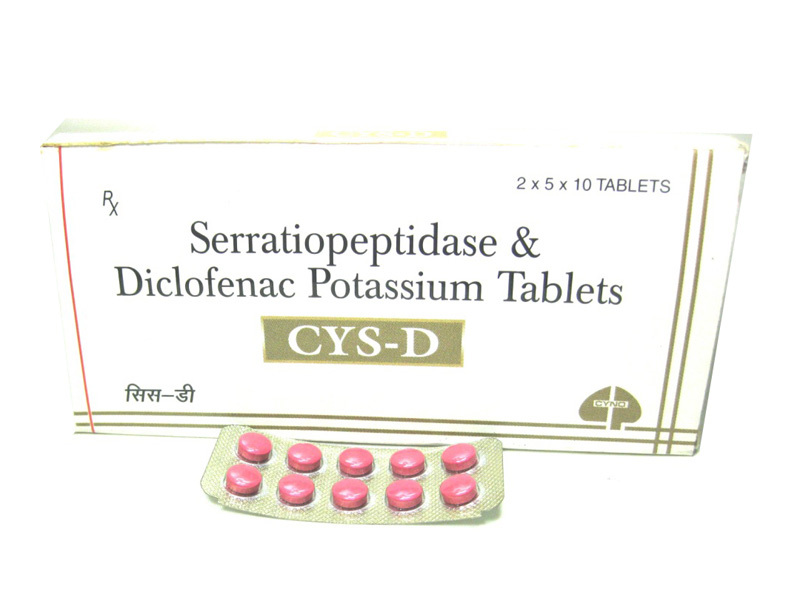 Diclofenac Potassium, safe and potent NSAID’S for pain relief in cardiac and diabetic patients. When combined with serratiopeptidase, a proteolytic enzyme, there is faster resolution of pain, inflammation and tenderness. The primary mechanism responsible for its anti-inflammatory/antipyretic/analgesic action is inhibition of prostaglandin synthesis by inhibition of cyclooxygenase (COX). It is a proteolytic enzyme derived from serrati SPP. Serratiopeptidase is a proven proteolytic enzyme that exerts a direct mucolytic action breaks the mucus and promotes expectoration and helps in antibiotic penetration. High enzymatic activity and potent anti-inflammatory effect with inhibition of Cox-2 suppressing prostaglandin and bradykinin hydrolysis. Helps in faster healing of trauma. Bioavailability-100%; Protein – binding more than 99%; Metabolism – hepatic, no active metabolites exist; Half life – 1.2-2 hr (35% of the drug enters enterohepatic recirculation); Excretion – biliary, only 1% in urine. Pain and oedema, Tendonitis, Dental extractions, Episiotomy, Breast engorgement, tonsillectomy, Oedema after ocular surgery, Bronchiectasis. Diclofenac is among the better-tolerated NSAID’S. Though 20% of patients on long-term treatment experience side effects, only 2% have to discontinue the drug, mostly due to gastrointestinal complaints. Contraindication Hypersensitivity against diclofenac, History of allergic reactions (bronchospasm, shock, rhinitis, urticaria) following the use of Aspirin or another NSAID, Third-trimester pregnancy. Blood coagulation abnormalities disturbance or under treatment with anticoagulants. 1 hour duration of action – 12 hours.